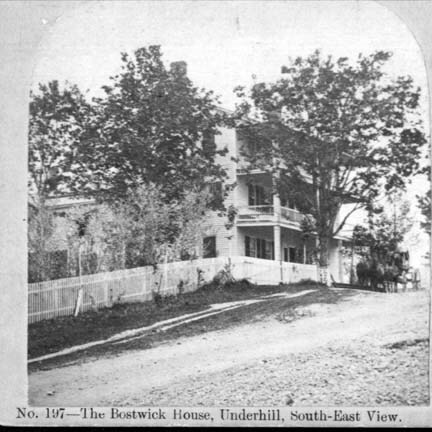 This hotel, located on what is now Route 15 just south of the intersection of the Raceway in the Riverside section of Jericho, was built by Arthur Bostwick about 1802 as a two story building, and later enlarged by Bostwick and his son-in-law Rufus Brown, who added an ell. In line with the temperance movement that swept the area starting in the 1840's is the fact that in 1851 Rufus Brown was licensed to sell small beer and cider, but NOT wines, strong beer, or spirituous liquors. About 1862, the hotel was bought by Leonard Dixon, who added a large three story addition and dance hall, with porches on all three stories, from which one could see both Mt. Mansfield, and, from the ell, the Adirondacks, and it later became known as the Dixon House. The hotel was on the stage route from Essex to Johnson, and was also a popular stop for travelers and teamsters transporting freight from Burlington towards the northeastern part of the state and Canada, before the days of railroads. The teamsters would arrive at dark with their big covered wagons, loaded with such things as grain, pork, lumber, furs and dry goods, and drawn by four, six or more horses, and leave again as early as three or four in the morning. The hotel was furnished throughout in a splendid manner for summer boarders, and several hundred visitors came each season, attracted by the popularity of the management, and the scenic surroundings of the place. With the coming of the B&L railroad, which passed just a few rods away, the hotel became even more popular, and special trains were run from Burlington to bring people to the dances. From the Chittenden Reporter - "The Underhill Citizen's Band are to give a concert and dance at the Dixon House Friday evening, Feb. 11th . The concert will consist of music by the band and male quartette. Solos, song, etc. will be rendered and a fine entertainment is looked for." And from January 9, 1889 - "The 13th annual Musician's Ball will be held at the Dixon House Jan. 25th." L.M. Dixon died at the hotel December 24, 1886, and the building was destroyed by fire on January 13, 1891. Both were mourned by "hosts of friends all over the country" who "used to be their guests and liked the genial ways of the host and comfort and good cooking of the old hostelry."